Greensand Ridge 4: Haynes-Sandy Walk at Haynes Walking RouteThe Greensand Ridge Walk is Bedfordshire's premier long distance walk. The route spans the county for a total of 40 miles, following the greensand ridge. The walk is an ideal introduction to the history, landscape and wildlife of this part of the county. Section 4, with stunning views from the ridge, passes Old Warden Tunnel Nature Reserve, the attractive village of Northill with its 14th century church, and ends in Sandy. 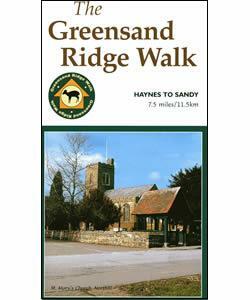 Start/Finish Point: The walk begins at Deadman's Cross, on the A600 close to the village of Haynes and ends on the High Street in Sandy. Start Nat GR: TL112419 Finish TL174492. How to get there by car/Parking: Haynes is on the A600, about 8 miles south east of Bedford. There is limited off road parking in Haynes.